Although the kids ended up pretty exhausted at the end of each day they were enthusiastic about the progress they had made. Evan Langford from Montego Bay Yacht club in Jamaica commented, “We are having a great time and the conditions and coaching are awesome”. Harbour House Marina heard about the clinic and offered to donate Gill sailing gloves to all the participants. 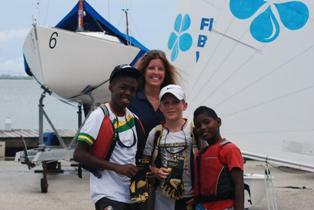 Jonathan Cuff, manager of Harbour House said, “We are always pleased to support Youth sailing. 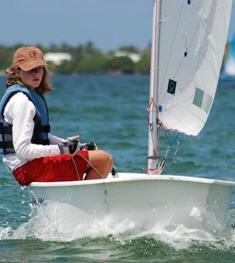 After all, they are the sailors of tomorrow”. The clinic ended with a mini regatta which saw Cayman sailors take the podium positions with Florence Allan winning from Pablo Bertran in second and Allena Rankine in third. Rick Caley, the CISC manager said, “We know we have a great venue for sail training here on North Sound and we are delighted that our neighbours from Jamaica could come over and join us. Our coaching staff is excellent and they have proved that they can run high class training clinics like this one. We hope to host other overseas sailors with similar events in the build up to the Western Caribbean Optimist Dinghy Championships in March 2012”.